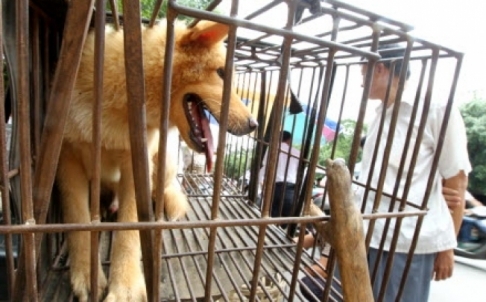 "Chinese animal activists flocked to Yulin, Guangxi province, to save the lives of hundreds of dogs before the local dog meat festival began on Friday. More than 20 activists from various cities in China, most of them Buddhists, spent more than 100,000 yuan (around HK$126,000), most donated by animal lovers, to buy and save around 400 dogs from the local markets.The activists have re-settled these dogs on a farm in Shangrao, Jiangxi province. “This year most of the dogs are females. They are pregnant. It’s so cruel,” said Du Yufeng, 55, an activist from an animal protection association based in China’s Sichuan province. She also campaigned in Yulin at the same time last year. An animal lover, Du founded the group after the 2008 Sichuan earthquake, when many dogs had to be killed for reasons of public sanitation, she said.